Asymmetrical Splitters 1x5 for FTTH Network - FIBRAIN - information centre - news, awards, events. Stay tuned! Fibrain company is introducing innovative asymmetric optical splitters, which facilitate construction of FTTH networks in family buildings. As it is known, almost all PLC splitters available in the market are symmetric splitters (for the division of optical power). These splitters are excellent for multi-family buildings where several subscribers are connected to the same distribution point in one building. This is a typical star network. In an area without multi-family buildings, centralized distribution points are not cost-effective. 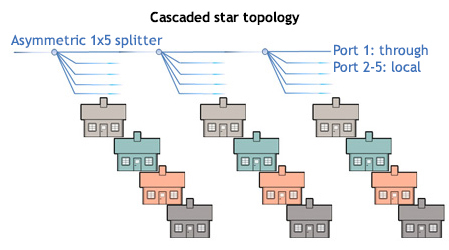 Then, cascaded star networks are often designed, where local distribution points are used to connect a few subscribers (home buildings). So far, operators were constructing the cascaded star network with 1x2 non-symmetric and 1x4 symmetric splitters, where they had to use extra splice and the whole solution was a lot more expensive. Innovative 1x5 Fibrain asymmetric splitters are a new solution to be used in cascaded star network, where port 1 is an output port, whereas ports 2-5 are local ports.